Loss of forests leads to droughts. Research has shown that destruction of rain forests in Nigeria, Ghana, and Côte d’Ivoire may have caused two decades of droughts in Africa. 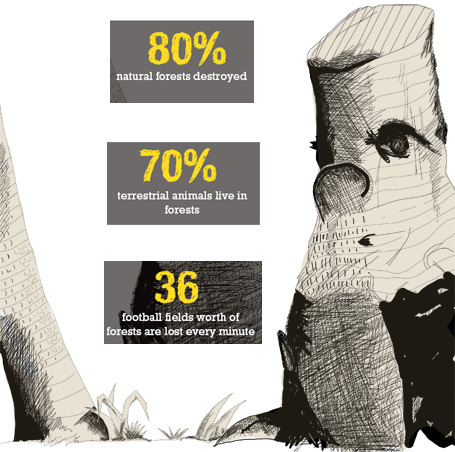 Rain forests are being destroyed at an annual rate of 31 million hectares, an area larger than Poland. Deforestation also contributes to the greenhouse effect. Trees utilise carbon dioxide in the air for photosynthesis. As we lose more and more trees, the proportion of atmospheric carbon dioxide increases, leading to global warming. Twenty-five per cent of the carbon dioxide added to the atmosphere over the past 150 years is thought to come from deforestation, but this is a small amount compared to what is still stored in forests.